Maria Latore's apartment (left) in GTA Liberty City Stories. Maria Latore's Apartment is the apartment of Maria Latore in 1998 and possibly in 2001. 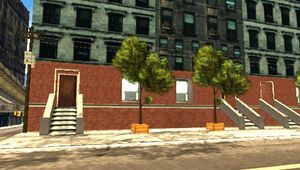 The apartment is located in Saint Mark's, Portland, Liberty City. Maria moves into her apartment due to her strained relationship with her husband Salvatore Leone. Maria's missions in Grand Theft Auto: Liberty City Stories are given from her apartment. Toni Cipriani inside Maria Latore's apartment during Booby Prize. Maria Latore inside her apartment with Toni Cipriani during Overdose of Trouble. This page was last modified on 10 June 2011, at 21:43.